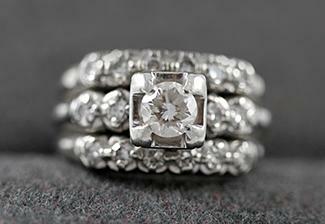 Many couples who are looking for something unique turn to art deco engagement rings. With elaborate settings and contrasting stones, these rings are miniature works of art that exemplify a couple's individuality while symbolizing their commitment to a life together. Vintage Diamond Rings features stunning antique art deco style rings in both 14K white and yellow gold. You can find unique pieces priced between $850-$1000. In addition, this site offers GIA engagement rings, loose diamonds and other antique jewelry pieces. 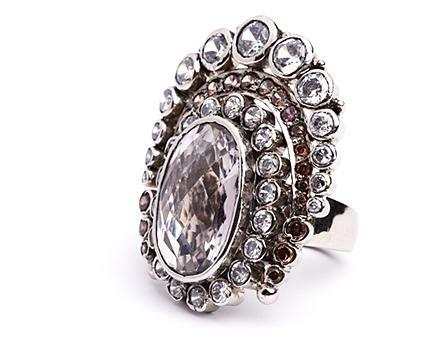 ERA Gems has vintage and antique art deco rings. Rings on this site are priced from $500 and up. Expect to find a wide selection of designs, from rings with diamond centers to those with rubies and sapphires. Rings are set in 14K white or yellow gold as well as 18K white gold and platinum. Fay Cullen offers a selection of art deco rings priced at $1600 and up. Rings are available in platinum and gold settings and can feature stones such as diamonds, rubies, sapphires and even emeralds. Lang Antique and Estate Jewelry features rings in platinum, yellow and white gold. All rings are unique designs featuring diamonds and other high quality gem stones. You can expect to find a vast price range of rings from ones ranging around $750 to styles with a price tag of $30,000. Art deco rings to mark an engagement were never diamond solitaires. Instead, a central stone - either a diamond or other colored gem - was surrounded by contrasting stones set in geometric angles and severe designs. Large size: On average, art deco engagement designs were larger than today's engagement rings and more comparable to modern bridal sets. Diamond size: General diamond size ranged between .5 and 1.5 carats, though the overall weight of the ring could be much higher when multiple accent stones were added. Stone cut: True art deco engagement rings were fashioned well before modern fancy cut diamonds, such as princess, heart, and marquise shapes. During the art deco period, emerald, Asscher and baguette cut stones were popular, and they were often surrounded by elaborate settings and uniquely fashioned stones in figural shapes. Metals: Art deco rings were composed of many metals, including both white and yellow gold. Platinum was especially popular because it was fairly new to jewelry manufacturing, and its bright white luster complemented the multi-colored rings without overshadowing elaborate designs. Furthermore, art deco jewelry was considered ultra-modern, and platinum was a lightweight, strong, modern metal that perfectly suited the progressive age. Contrast: Contrasting stones and colors are a key factor in art deco engagement rings. Rarely is there an art deco ring that would be considered a solitaire. Instead, a central gem would be surrounded by other stones to create an extravagant overall design. Coral, rubies, emeralds, onyx, lapis, turquoise, and jade were popular choices in addition to diamonds. During the Great Depression, emphasis was focused on the ring's overall design rather than a large center stone, since designing an elaborate ring with many small, less expensive gems was more practical than using larger, less affordable stones. An art deco ring with heart symbolism may take many forms. Authentic vintage engagement rings may use some of these techniques to add romance to the ring, while contemporary engagement rings frequently feature bolder, more obvious heart motifs. Faux Hearts: Using more basic diamond shapes to create a simulated heart emphasizes the beautiful geometry of an art deco style. Two pear shapes may be aligned into a heart pattern, or multiple round diamonds could be grouped into a small heart shape. Heart Accents: Elaborately detailed rings may incorporate subtle heart motifs in a filigree pattern, along the sides of the ring setting, or leading up to the prongs. Micro Pave: Micro pave engagement rings may create clustered heart designs encrusted with sparkling diamond chips. 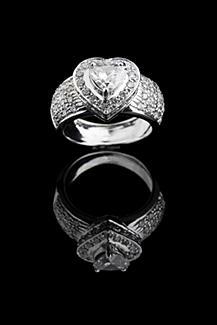 Larger pave designs can also create heart shapes in bold styles perfect for an art deco inspired ring. Outlines: If the ring's central diamond is a heart shape, it may be outlined in bold geometric accents such as tapered baguettes or small side stones to emphasize the symmetry and detail of the ring while still highlighting the heart shape. Settings: Choosing a flush or bezel setting for a heart gem helps incorporate it directly into the ring design and can make it more integral to the art deco pattern. Much emphasis for art deco jewelry was placed on design rather than monetary value or carat weight. The detail symbolized the sophistication and hope of the modern age, a perfect complement to a couple's hope for their future. Geometric shapes: Ring designs often had exquisite settings in sleek, geometric shapes. Angled patterns: Detailed designs might be comprised of angular patterns. Nature: Some styles mimic softer patterns like lace, flowers, or leaves fashioned with intricate metalwork. Today, jewelers can create modern reproductions of art deco designs customized to meet the couple's individual tastes. These new rings can incorporate more modern diamond shapes and fancy cuts, as well as other intimate details such as engraving and scrollwork. Furthermore, modern stone choices, such as tanzanite and aquamarine, can be included, which were either unavailable or exceedingly rare during the art deco period. Before buying this type of ring, consider some of the following factors to help you decide if it is right for you. Antique art deco pieces can be quite expensive and are increasingly hard to find. While the stones, cut, and craftsmanship may not be as fine as for modern rings, the age and uniqueness of the piece heavily influences the price tag. Modern reproductions, however, can also be quite expensive because they may use higher quality stones and personalized design. In general, off-the-rack reproductions are far less expensive than either customized rings or antique pieces. Because of the elaborate design, caring for an art deco engagement ring can be tricky. Small accent stones may be especially fragile and prone to becoming loose, increasing the risk of loss or damage. Because most rings incorporate different types of gemstones, cleaning guidelines vary depending on which stones are most resistant to different cleaning processes and chemicals. Art deco rings should always be carefully stored away from other pieces of jewelry that could scratch or nick them. When taking an art deco ring to a jeweler for cleaning or repair, always ask if the jeweler is experienced with art deco pieces to ensure they provide the best possible care for your ring. Art deco jewelry originated in Paris, at the world's fair entitled "L'Esposition De Arts Decoratifs" when the commercial applications of art deco design were first exhibited. The style was most popular during the extravagance of the 1920s, and while the Great Depression necessitated changes in art deco jewelry, it wasn't until World War II that the popularity diminished. While art deco may seem to be a unique and exceptional choice for an engagement ring, they are not the most practical pieces of jewelry and are not suitable for brides-to-be who lead active lifestyles. Furthermore, if she is very style conscious and always matches her jewelry to her clothing, an art deco ring may not fit well with her wardrobe. If, however, she prides herself on her eclectic flair, an art deco ring may suit her personality and preferences very well. In general, unless the woman has specifically pointed out art deco jewelry and admired their design, it may be best to choose a less specialized style or wait to purchase the ring as a couple. With elaborate designs, contrasting colors, and sharp angles, art deco engagement rings are unique choices for adventurous couples. As modern rings designed for a hopeful future, these pieces are suitably symbolic for couples hopeful about their future together. Whether you choose a reproduction or an authentic ring, it will make a bold statement about your style and optimism for a long, happy marriage.